When the weekend comes and it's time to head outside, have the Amish Cedar Wood Bistro Bar Set waiting for you on your porch, patio or pool area. This gorgeous cedar wood outdoor furniture provides a bar height table and two swivel captain's style chairs to enjoy drinks, snacks, cards, lounging and more outdoors. Take it easy in these wood bar chairs that offer Adirondack style comfort with wide chair slats, sculpted seats and cozy arm rests. Tuck your feet into the stretchers as you enjoy a cool beverage and soak up the sun! You'll be investing in eco friendly furniture with this outdoor cedar furniture. The wood is grown and harvested in the U.S. and is thermally modified, increasing its strength and resistance to the outdoor elements. This wooden outdoor furniture set is sealed with Pure Wood Sealer that is chemical free, making this table and chairs a handmade, all-natural choice for your family to enjoy. 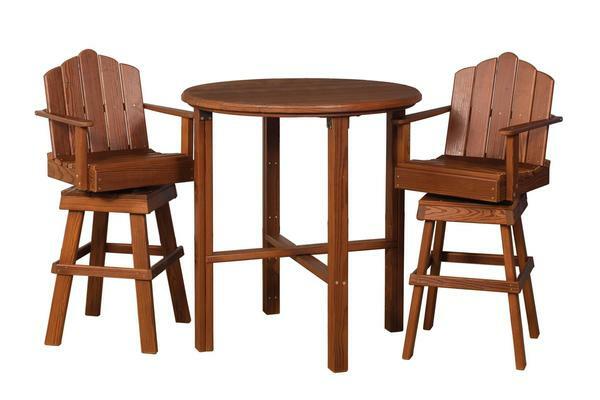 With a fun swivel in each seat and a round wood table made of rich cedar wood, this Bistro Bar Set is sure to draw many an eye when you step outside. If you've already got bar height seating outside and are just looking for a table to match,our Amish Outdoor Bistro Table can be purchased separately. Be sure you're set up with everything you need outside. Check out our blog post, Summer Must Haves for a list of outdoor essentials.